When Peter and I were in the middle of our careers, each of us took business trips on our own, except for once or twice that I was able to cash in on one of his trips in order to do my own thing while he was communing with clients and colleagues. We really had no expectations to spend time together other than at night, because–as I imagine most of you know–business trips are so all-consuming that all one can do when you finally get back to your hotel room is to fall into a deep sleep. Only rarely were we able to fit in even one tête-à-tête dinner during such a trip. Other than these essentially separate trips, we did other separate ones too: given that our family lived in South Africa, it often happened that the one or the other of us had to travel to South Africa to deal with a family illness or death. Whenever possible, we would build in as much “vacation” time as possible into these “family business” trips. We called our separate excursions “marriage vacation.” Each of us admitted enjoying the trips on our own because of the break they gave us from each other. Yes, even in what I think of as our fabulous marriage, each person needs alone space for a few days running, at least some of the time. Nowadays,we find our alone space during the course of the day, when each of us are doing our own thing in different rooms of the house, or when I go walking in the mall to clear my head and Peter can focus on his own stuff rather than always helping me with things. Last night, we took a trip together, albeit only a few blocks south on State Street to the DF Dance Studio, which has a Latin night on the 2nd and 4th Fridays of every month. We had gone a few times last year, but had fallen out of the habit when life got too busy. We have now resolved to go regularly again. 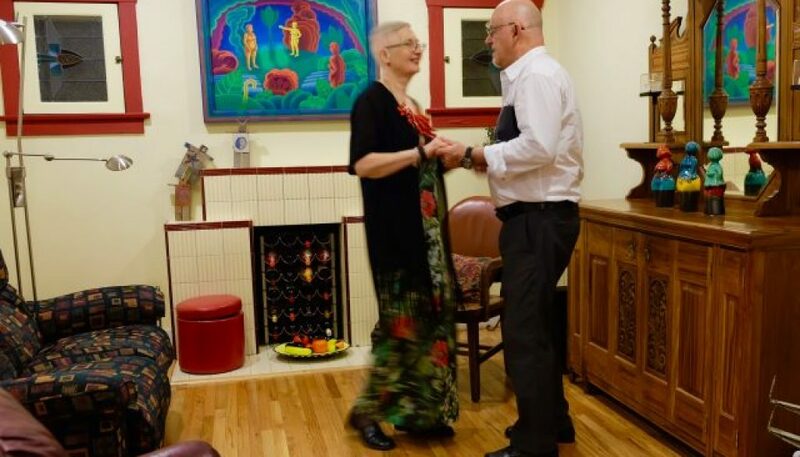 Last night we had such a wonderful time that when we came back around midnight–way-y-y past my bedtime–I told Peter that I felt I had been on a “dementia vacation,” a break from the Doña’s constant interference. This time, Doña Quixote would stay home. Or so I told her. When Peter and I started “going steady” almost 50 years ago, he taught me to dance. When we met, I knew enough ballroom dancing to get by. From our first time out dancing, though, I realized that my dance moves were to his complex choreography as a walk in the park is to a marathon–he’d been immersed in ballroom dancing since his Matric year in high school, doing competitions, exams, the works. He had even, as I would discover, taken an exam that qualified him to be a dancing teacher. Salsa–anything Latin, indeed–was his special love. I became his willing pupil. Peter and Gerda at a university dance in Pretoria, South Africa. 1969. In those magical days, we studied together. Our reward for completing the assigned chapters for the day, was an hour or so of dancing in his parents’ living room, to music emanating from a hi-fi system of which he had built the electronic parts himself–those were the days of vacuum tubes–and that his father had,per Peter’s design, encased in a beautiful display cupboard and enormous speaker boxes out of wood. Peter built an amplifier with vacuum tubes. 1966. I then lived in a university hostel a few blocks from the apartment where he lived with his parents. After our studies and dancing were done, he would walk me back to the hostel in time for my 10 pm curfew. I lived on the 9th floor (or s0), and from my window I could see his bedroom window in the three-story block of flats. At 11 am every night, we would each flick our bedroom light for the other. That world is where I spent my dementia vacation last night. Our only concession to the Doña was that, during the bachata lesson that preceded the social dancing, we did not rotate around the circle to dance with other partners. I had learned that the effort of trying to decipher another dance lead’s signaling took so much mental energy that I would not do well in the social dancing afterward. Also, there was my bad balance to consider–I seem to do well enough when he leads me through the steps. It helps that in salsa the dancer’s bodies are almost always connected by a hand-hold or touch. I stumbled only a few times. The main factor that affected my balance was the mirror ball that dotted the prom-like space with moving lights. When I looked down at my feet to check steps we were trying out, it seemed as though the floor was spinning like a vinyl record in Peter’s long-ago sound system. I got so dizzy that I almost fell over. I also felt the same anxiety that I feel when I am lost in a mall or store. I had to stop looking down, so Peter signaled me with word cues until I had the particular step down. Sadly, I can no longer do the spins where he tosses me away from him–we discovered that the hard way a year or two ago. Other than that, I felt that I could do everything we needed to have a lovely time. And who really cares–we danced as if we were the only people in the room. I loved this captivating story and the pictures accompanying it. I am so glad you had such a wonderful evening! Thank you again for sharing your experiences. Dear Carrie, thanks so much for your kind words and your support. It means so much to me that the experiences I will soon forget mean something to others while I do remember them. I wish you and those you love everything wonderful in your lives. Thanks for your lovely comment, Sandy. It means a lot to me that you are reading about my experiences. All the best to you and those you love. I noticed that you have both “unisa” and “uvu” (Utah Valley University?) in your e-mail address. I’d love to hear more about your story. Jy laat dit so lekker klink, ek dans sommer saam! En al die wonderlike herinneringe van ons jeug! Sterkte liewe Gerda! Altyd so lekker om van jou te hoor, Elza. Dis wonderlik dat ons mekaar nog ken noudat ons jeug lankal verby is. Dankie vir die saamdans. Ek verlang so na jou. Ek was van die begin van die jaar af nie so lekker nie–ek blameer liewer die griep as die demensie…Het net nie die energie gehad vir korrespondensie nie. Voel vir die laaste paar dae soveel meer “by.” Wens ons kon tog maar saam sit en ‘n koppie tee drink! Baie liefde vir julle almal–jy en Koos is mense in my herinneringe wat altyd die lewe so geniet–ek kan net ding hoeveel pret julle gehad het in julle nog-jonger dae voor ons julle leer ken het. Wat ‘n geluk dat Peter en Koos saam gewerk het. Great story! Duane and I haven’t gone out dancing in ages; I’m at the point where I feel awkward dancing at the gay clubs (I suppose at other clubs, too) where the focus is on the youthfulness which escapes me daily, or on the trendy clothes that I can’t afford or which don’t suit me. Sadly, I’m from a ballroom dancing family, but only know the fundamentals. The cha-cha and samba are the closest I’ve come to Latin dancing. (And here, for years, my stepmom was the South African ballroom and Latin dance champion!). Duane and I need to take a leaf from you book — and perhaps join you! Thanks so much for your lovely comments, Brian. YOu guys should definitely go. Google DF Dance Studio, and you’ll see that there is social salsa every 2nd and 4th Friday of the week. There are classes on other days too. Thanks also for your lovely comments on my blog. I still remember how much I learned about you when I read your thesis. About not always loving adequately, I think that happens in every long-term relationship. As long as one gets startled now and then into remember a “return to the honeymoon” of falling in love at the start. Love you guys.